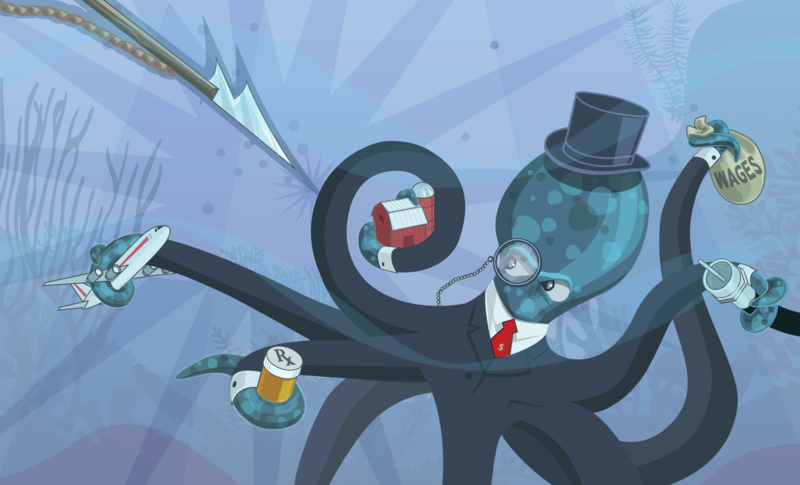 Antitrust and competition issues are receiving renewed interest, and for good reason. So far, the discussion has occurred at a high level of generality. To address important specific antitrust enforcement and competition issues, the Washington Center for Equitable Growth has launched this blog, which we call “Competitive Edge.” This series features leading experts in antitrust enforcement on a broad range of topics: potential areas for antitrust enforcement, concerns about existing doctrine, practical realities enforcers face, proposals for reform, and broader policies to promote competition. Andrew I. Gavil has authored this month’s contribution. 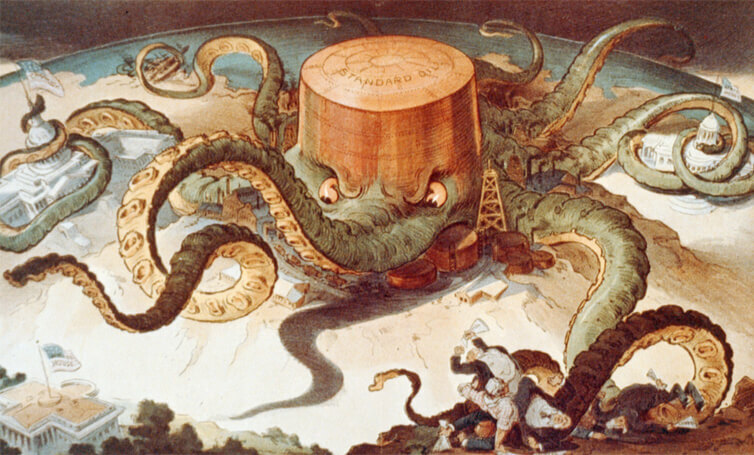 The octopus image, above, updates an iconic editorial cartoon first published in 1904 in the magazine Puck to portray the Standard Oil monopoly. Please note the harpoon. Our goal for Competitive Edge is to promote the development of sharp and effective tools to increase competition in the United States economy. Antitrust policy is not a typical candidate for vibrant public debate, but these are not typical times. Concerns about rising corporate concentration, an increased incidence of market power in some sectors of the U.S. economy, and evidence of growing wealth and income inequality are the triggers for this debate—one that pits advocates of radical reforms against defenders of the status quo. Much of the debate is focused on the effectiveness of Section 2 of the Sherman Antitrust Act of 1890, the first federal law to outlaw monopolistic business practices by single, powerful firms. As it has been interpreted by the Supreme Court over many decades, however, Section 2 has been largely circumscribed to the point where major government prosecutions are rare and few private challenges succeed. If Section 2 is to be an effective tool for policing and deterring anti-competitive conduct in today’s economy, then it will need to be adjusted for the needs of our time. But first it is important to understand how Section 2 became so limited in scope, beginning with the origins of the Sherman Act. Choosing the language of the Sherman Act, the Congress of 1890 turned to common law, which had long prohibited “unreasonable restraints of trade” and various forms of monopolizing conduct. That Congress was concerned about the collusive and exclusionary practices of the corporate behemoths of the day, the trusts such as Standard Oil. The result was a statute that included prohibitions of concerted action (Section 1), as well as monopolization, attempts to monopolize, and conspiracy to monopolize (Section 2). In one of its earliest interpretations of the Sherman Act’s critical language, the Supreme Court concluded in Standard Oil Company of New Jersey v. United States (1911) that both Sections 1 and 2 ought to be guided by a “standard of reason.” The Court would later also observe that the intent of the Congress was not to codify the specific content of the common law as it existed in 1890, but rather to embrace its process so the law could evolve and adapt over time. As the Court put it, with specific reference to Section 1’s “restraint of trade,” the Sherman Act “invokes the common law itself, and not merely the static content that the common law had assigned to the term in 1890.” Congress, the Supreme Court said, “expected the courts to give shape to the statute’s broad mandate by drawing on common-law tradition.” In the wake of this ruling, federal courts, guided by public and private litigants, were assigned the role of defining the content of the Sherman Act’s prohibitions. This approach to Section 1 has been lauded as critical to its success and durability. 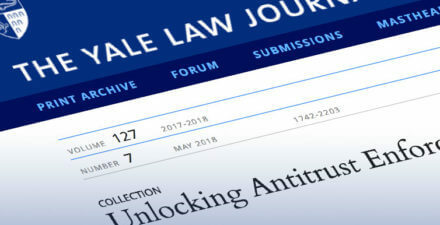 It has permitted the two federal antitrust agencies—the Federal Trade Commission and the Antitrust Division of the U.S. Department of Justice—and the courts to reshape the standards of pleading, production, and proof in antitrust cases over time to reflect new economic learning, new industry conditions, and new business models and practices. Although some critics view the current state of the law as too permissive, they would, in part, invoke that same flexibility to alter course and enhance its prohibitions. Sections 1 and 2 share common roots in the common law, but in contrast to Section 1’s evolution over time, Section 2’s prohibitions have become locked in time, captives of the past. That past has been shaped in large part by the decisions of two legendary jurists, Justice Oliver Wendell Holmes and Judge Learned Hand, and two decisions they authored: Swift & Co. v. United States (1905) and United States v. Aluminum Co. of America (1945), respectively. These two cases, and others that followed, committed Section 2 to an approach that focuses almost obsessively on very high market-share benchmarks as determinants of a firm’s power, instead of more direct measures—creating effective safe harbors and leaving gaps in U.S. law that have likely impeded the ability of Section 2 to evolve with economic learning and changes to the U.S. economy. In Swift, Justice Holmes offered a brief but enduring interpretation of Section 2’s “attempt to monopolize” offense. Drawing on the Sherman Act’s use of common law concepts and its inclusion of a criminal prohibition, his expertise as a student of the common law, and an earlier non-antitrust criminal law decision he had authored while on the Supreme Judicial Court of Massachusetts, Holmes declared that to establish an “attempt” offense under Section 2, the government would have to prove a “dangerous probability of success,” meaning a dangerous probability of achieving monopoly. The full import of that holding was not realized until the decision in Aluminum Co. of America (Alcoa), where, sitting as the Supreme Court, the Second Circuit established the now-familiar and durable “power + bad conduct” framework for cases alleging monopolization, which requires proof of both monopoly power and exclusionary conduct. To define “monopoly power,” Judge Hand looked back at previous decisions of the Court to formulate his influential market-share benchmarks for identifying monopolies: 90 percent (“enough to constitute a monopoly”); 60 percent to 64 percent (“doubtful”); 33 percent (“certainly…not”). Markets, he said, would thereafter have to be “defined,” as was the case in Alcoa, in order to facilitate such market-share calculations, a conclusion that was reinforced a decade later by the Court’s United States v. E. I. du Pont de Nemours & Company decision (1956), which implied that 75 percent would also be enough to constitute a monopoly. The Court acknowledged and endorsed this “gap” between Sections 1 and 2 of the Sherman Act in its 1984 Copperweld Corporation v. Independence Tube Corporation decision. In its view, the Sherman Act’s framers intended it by design, so unilateral conduct would be treated more permissively than the concerted conduct prohibited by Section 1, for fear of discouraging aggressive but competitive conduct by single firms. But that proposition was wholly at odds with Standard Oil’s view that Sections 1 and 2 were intended to be complementary, leaving no gap at all. This preference for circumstantial evidence was arguably extended even further by the Supreme Court’s recent 2018 decision in State of Ohio v. American Express, which appeared to conclude in a controversial footnote that defining a relevant market and inferring market power are necessary prerequisites to the assessment of the competitive impact of all “vertical” conduct, even under Section 1, regardless of the availability of more direct evidence that it has had an adverse impact on competition. The Court in Alcoa expressed the view that it might be necessary to tolerate monopoly occasionally, but that was not to say it was desirable. Although Judge Hand’s application of these principles to the facts of Alcoa has been criticized and might not be followed today, these core principles have largely proved enduring and have guided the law of monopolization for more than seven decades in cases such as Aspen Skiing Company v. Aspen Highlands Skiing Corporation (1985) and United States v. Microsoft Corporation (2001). More recent pronouncements from the Supreme Court addressing exclusionary conduct, however, embrace a different and far more cautious narrative. Like Copperweld, Brooke Group Ltd. v. Brown & Williamson Tobacco Corporation (1993) and Verizon Communications, Inc. v. Law Offices of Curtis V. Trinko, LLP (2004) have emphasized concern for false positives and fear that liability standards that are too easy to satisfy will inhibit competition, especially innovation, by both dominant incumbents and rivals alike. And, in contrast to Alcoa, the Court in Trinko reasoned that “the opportunity to charge monopoly prices—at least for a short period—is what attracts ‘business acumen’ in the first place.” This supposition about monopoly transforms Alcoa’s grudging acceptance into a near embrace and ignores that the dream of monopoly is hardly the motivation that drives most firms to compete. Profits, maybe, but true “monopoly prices?” The embedded assumptions in such cases, layered onto the highly formalistic framework established by Swift and Alcoa, have no doubt limited the reach of Section 2. Fully integrate a more sophisticated understanding of exclusionary conduct, market power, and anti-competitive effects. Such an approach would prohibit exclusionary conduct (unilateral or concerted) that significantly contributes to the creation, entrenchment, or enhancement of market power, allowing for methods of proving power through alternatives to defining markets and calculating market shares. This more contemporary approach would be more consonant with trends in most other modern antitrust law. It would untether the law of exclusionary conduct from blind and formalistic reliance on market-share benchmarks, while also allowing for cognizable and verifiable efficiency justifications. In theory, Section 2’s common law origins should allow for this kind of evolution in the courts, but it might instead require legislative reform. In the end, under either approach, change would open up needed space for Section 2 to begin to evolve once again, as has Section 1, so it could adapt to the needs of our time. In support of their current-day agendas, some of the most vocal advocates in today’s debates have turned to the past, invoking the words and ideas of former Supreme Court Justice Louis D. Brandeis, who championed progressive competition-law reforms in the early part of the 20th century, and former U.S. Court of Appeals Judge Robert H. Bork, one of the principal proponents of the Chicago School of Antitrust, who, in the late 1970s, influenced the modern shift toward a more economic approach to antitrust analysis, including a pronounced concern for false positives. 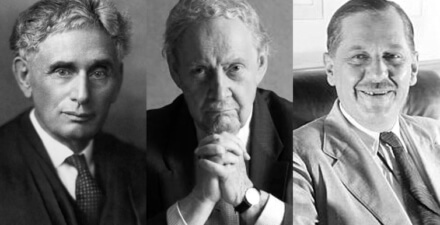 Although the collective wisdom of the past can surely inform today’s policy discussion, as smart as Brandeis and Bork were, they are best understood in the context of their own times, when they were responding to the issues and antitrust doctrine of their day. The economy of 2019 is not the economy of 1912 or 1978, and the antitrust doctrine of 2019 is not the same as that of 1912 or 1978. To address the challenge of designing a monopolization law for our era, policymakers, advocates, and the courts will need to do more than selectively borrow from the ghosts of past antitrust debates to advance current-day agendas. What is required instead is the construction of a new and balanced consensus that can address the needs of this time. —Andrew I. Gavil is a professor of law at Howard University School of Law. 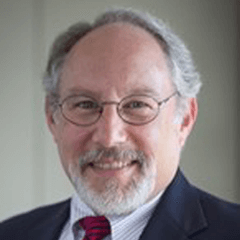 This posting is adapted from remarks delivered at the American Antitrust Institute’s Competition Roundtable, Challenging Monopolies in Court: Where Have We Been and Where Are We Going?, on March 14, 2019. The views expressed here are his own.